On the 24th, my daughter Meadow turned 4. She goes to pre-school and they celebrate birthdays. So I made some special birthday chocolate chip cookies to take to her class. Let me say that there is some processed sugar in these. Not much, but I bent my normal rules because it was her birthday treat. I do allow my children to have treats once and a while, and a birthday is an occasion where a healthy chocolate chip cookie recipe that bends the rules a little is in order. This healthy chocolate chip cookie recipe would be a great transition for those looking to eat healthier versions of sweets. It’s sweeter than I normally would make, but if you are used to super sweet cookie recipes, this one is a great stepping stone. Everyone loved them. They are also gluten free and nut free! Add wet to dry and mix until everything is combined. Drop cookies on lined baking sheets and bake for about 13-15 minutes. I got 19 cookies out of my batch. Enjoy! You're welcome! Many of my recipes are gluten free. Going forward, almost all of them will be. We can digest wheat, but we don't eat much of it anymore. A belated happy birthday to Meadow! What a pretty name :) I love oaty cookies, usually with raisins though not chocolate (shock horror!). That sounds like a great idea! Happy Birthday to your little ones as well! Wonderfully healthy cookies - they're almost a meal! Oh and I love your daughter's name! I hope she had a lovely birthday! I have been following your blog for a bit now and am happy that every recipe I have tried my 20 month old daughter loves and often asks for more. It is great! I wanted to say thanks for all the great recipes and I am always excited when there is a new post. Hope your daughter had a great birthday. You're welcome Nicole. I'm so happy to hear that. Hi Melissa, These look delicious! There are no serious egg allergies in my house here, so I will definitely be trying them that way. 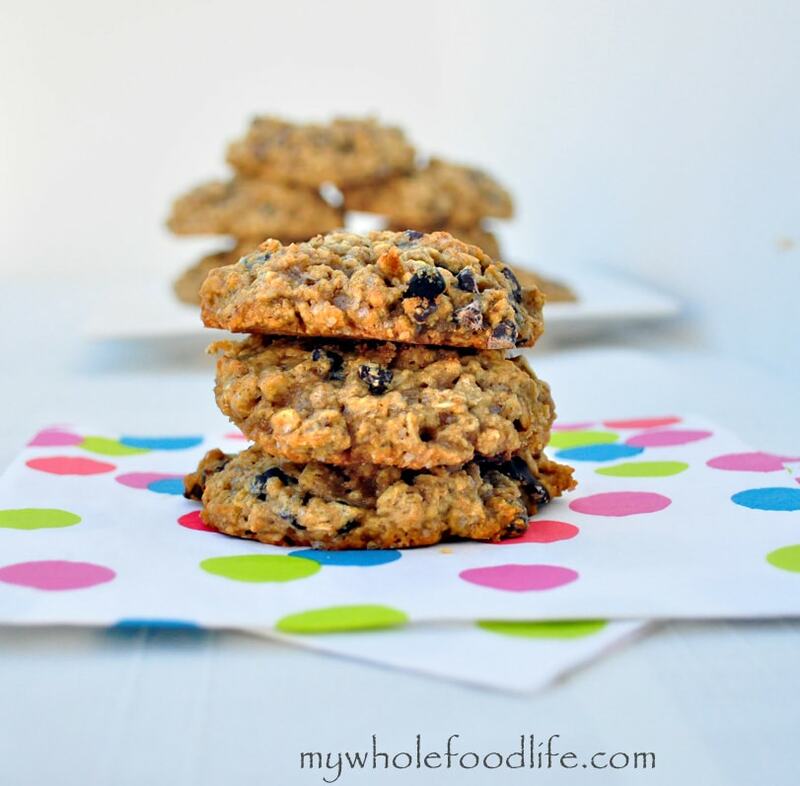 I love that they are just made with oats too! :-) Happy birthday to your little Meadow! Can you make your own oat flour? Yes you can. Just grind up some rolled oats in the Vitamix if you have one. Hi, I'm new to your blog and love all the recipes I've seen so far! I'm so sorry if you've already addressed this, but how do use the flax meal in place of egg? And 2 eggs equals how much flax meal? My son has a severe egg allergy and we have always used Ener-G egg replacer. I have found that the consistency isn't so great in cookies though. Thanks! Just made these too. I didn't have any applesauce, so i swapped in a mashed banana and some water so that the total volume was 1/2 cup. Absolutely DELISH! My son has been begging for some chocolate chip cookies so I made these today. I used Coconut sugar in place of the raw and brown sugars and they came out so good! Thanks for another great recipe we love! You're welcome! Glad you liked them! Hi, I love your site. I was wondering if used regular flour if the measurements would be the same. Thank you! Yes I think so.